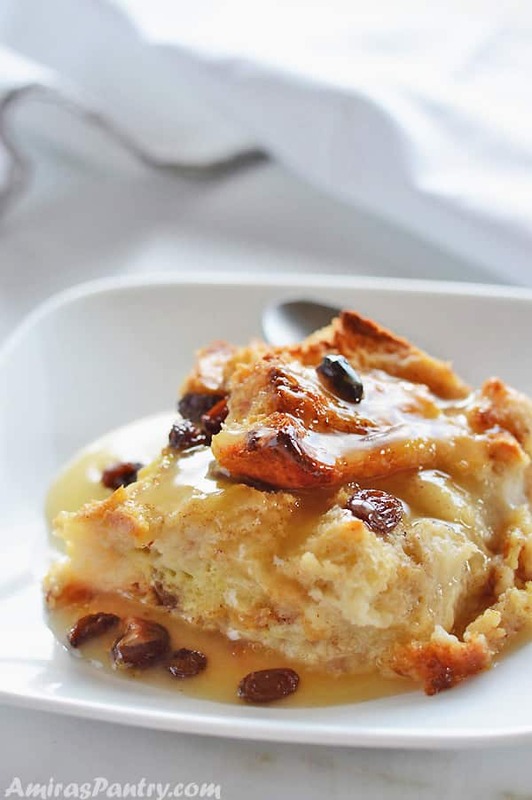 Easy traditional bread pudding recipe is a homey, old school comfort food that can be served in breakfast, brunch or as a dessert. A delectable classic that will make your home smells like cinnamon-vanilla heaven. 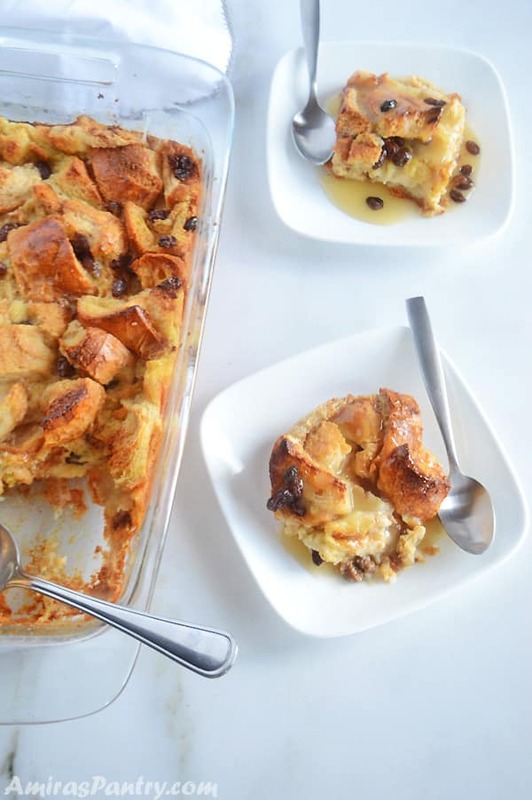 This bread pudding recipe is the living proof that leftover bread can be easily turned into a delicious dessert. This recipe has room for innovation. Consider using fresh fruits, changing the soaking juice and hence changing the final drizzling sauce. Play a bit more with the spices for a new flavor each time. 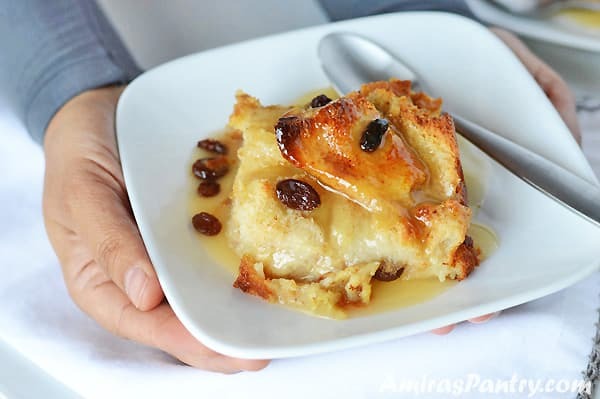 Check out the Egyptian version of bread pudding here. This post has been updated from the original July 2018. Last updated February 2019. 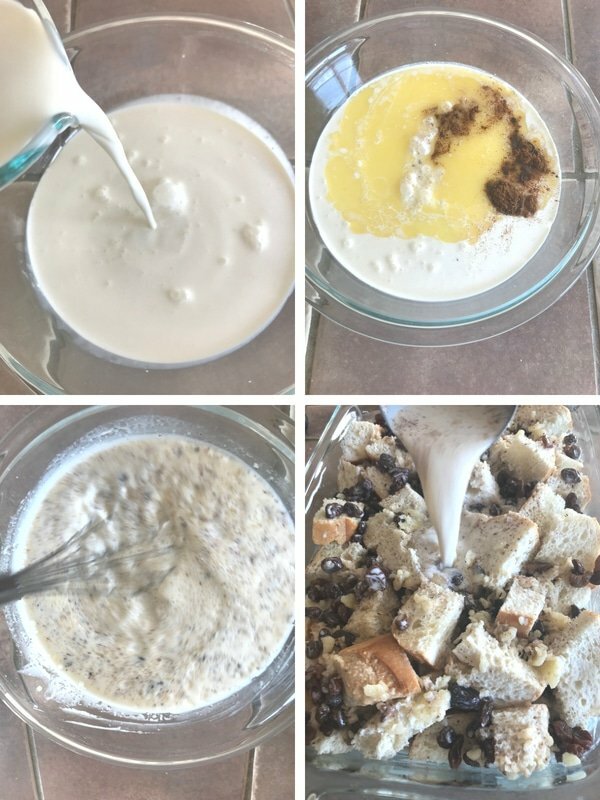 This easy bread pudding is our favorite dessert, it is so simple to make yet holds loads of flavors. 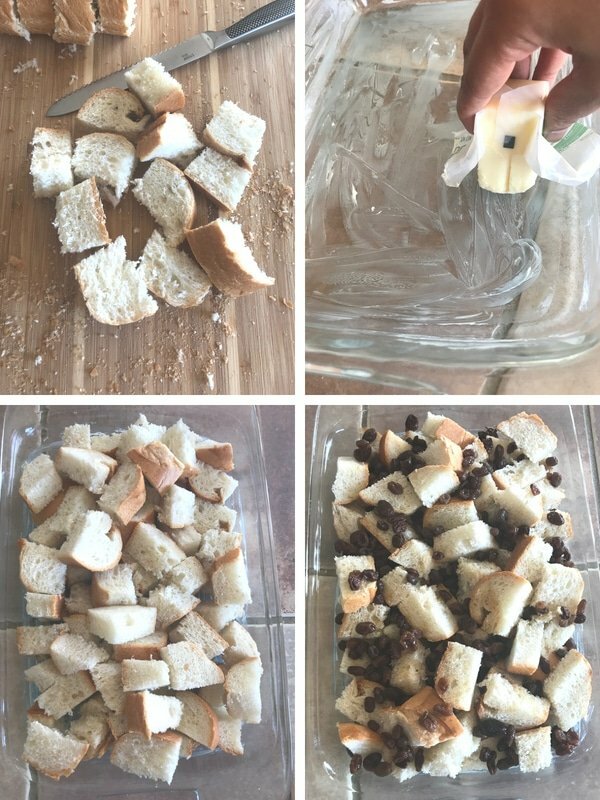 It is a great way to use up leftover bread in your home. Old fashioned bread pudding can be the vehicle to so many flavors, I loaded mine with raisins, vanilla and cinnamon. When I was making this recipe, we’ve had a couple of the kiddos’ friends over, they were all playing in the basement and let me tell you, they came up running through the kitchen sniffing around with bright eyes and hungry bellies. The smell was charming and will make you drool 襤. What kind of bread is used for bread pudding? Basically, any bread will work. Here, I’ve used a day old french bread. A classic choice is sweet bread varieties like brioche. I’ve seen people use anything from cinnamon swirl bread to hotdog buns! What are the ingredients for bread pudding? It is a genius recipe made from stale bread, milk, eggs, sugar and flavors. Ridiculously simple made from everyday ingredients. It’s pure genius! Where did bread pudding come from? According to the gazette, bread pudding was called the poor man’s pudding. It goes back to the 11th century as a way to use leftover or stale bread for frugal cooks in England. As tempting as it may be, I try to stay clear ,as much as possible, from labeling recipes in this space with high profile words like ” the best” or “best ever”. This is basically because I’ve learned something from this blog, we all differ, our taste buds are different and what might be the best for me might not be best for others and vise versa. I always encourage my readers to venture in recipes and kick it a notch with their favorite ingredient and play with flavors to their liking. This recipe for bread pudding my friends is seriously “THE BEST BREAD PUDDING RECIPE”… here I said it. 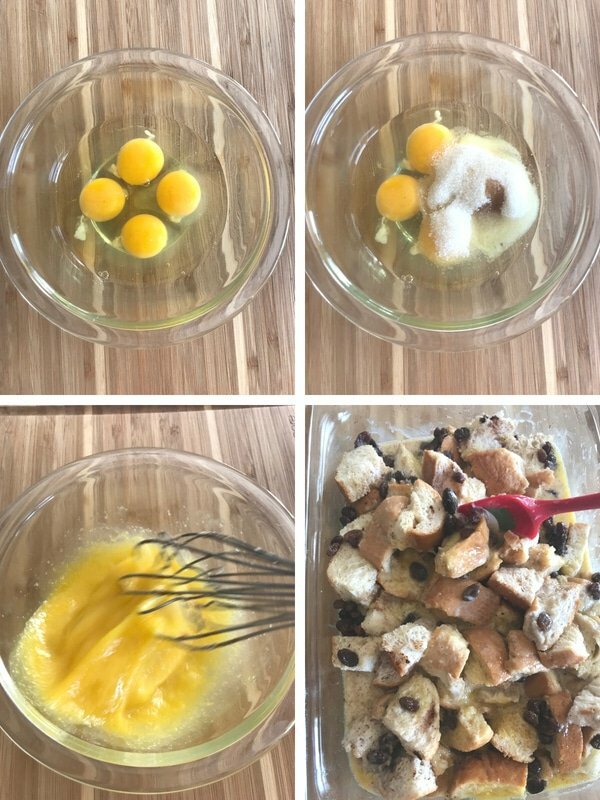 How to make bread pudding? First, I soaked raisins in apple juice for a couple of hours. We love raisins in my house and nobody will mind having it in. Cut the bread in cubes and I left the crust to make for a crunchy top. Butter a 13×9 pan, I like holding the stick and butter the pan like the photo above. Add the bread cubes and the raisins with any leftover apple juice, no need to strain. In a deep bowl, mix sugar, cream, spices like cinnamon, a good tablespoon of vanilla extract and melted butter. You’ll notice that the butter will solidify into small pieces, this was easier than cutting the butter into small pieces and trying to spread them all around… just sayin’. Pour the cream mixture over the bread, press down a bit with a spatula and let the bread soak for about 10 minutes until you prepare the eggs. In a separate bowl, beat eggs,sugar and 1/2 tablespoon of vanilla extract. Pour the egg mixture over and carefully mix. Pop in the oven and bake for 50-60 minutes until it gets puffy and smells heavenly. Now, you might not care for the sauce but let me tell you the kids fought over it, I’ve made a simple sauce made out of butter, sugar and apple juice and thickened it with cornstarch. It added more flavor and richness to the dish. You can add nuts if you would like to, but the kiddos at our home were allergic so we skipped this part. Get naughty and serve it warm, topped with a scoop of vanilla ice cream with a drizzle of the sauce we just made… A real game changer. I love this Pyrex baking dish has been with me for ages and it survived so many dishwasher loads. If you are looking for an exotic twist to this simple bread pudding, check out this pecan pie bread pudding from Paula. 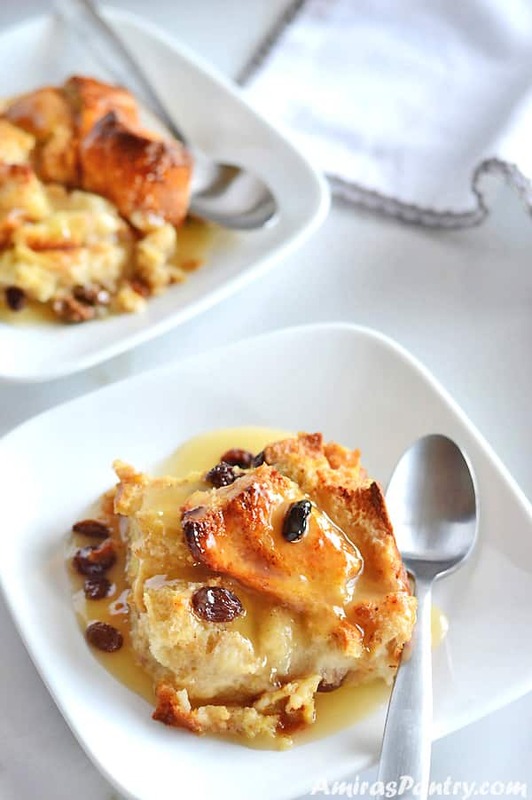 Traditional bread pudding recipe is a homey, old school comfort food that can be served in breakfast, brunch or as a dessert. A delectable classic that will make your home smells like cinnamon-vanilla heaven. 4 Tablespoons unsalted butter divided. 1 cup white sugar divided. 4 cups heavy cream or milk. 1/2 Table spoon cornstarch dissolved in 1/4 cup of apple juice. Soak raisins in apple juice for about an hour or two. Preheat oven to 350 degrees. Brush a 13×9 baking dish with 1 Tablespoon of butter. In a deep bowl, add 3/4 cup sugar sugar, cream or milk, butter, 1 Tablespoon of vanilla extract and cinnamon. Mix well until sugar almost dissolves. Pour the milk mixture over the bread and press lightly to soak all bread, set aside for 5-10 minutes. In another bowl, mix eggs, remaining 1/4 cup of sugar and remaining vanilla extract. Pour the egg mixture over the pan and carefully mix. Bake uncovered in oven for 50-60 minutes or until a metal knife inserted in the middle comes out clean. Cut, serve drizzled with the sauce, ice cream scoop or as is. In a small saucepan over medium heat, melt butter, then add sugar and stir. Dissolve cornstarch in the apple juice then add to the sauce pan. Stir everything together for a couple of minutes until it thickens. * I liked leaving the crust on as it crisps and give the pudding that top crunchy texture. ** Making the sauce is completely optional but highly recommended. Happy you liked it Enee, thanks for the feedback. ENEE, I like it hot :), my kids like it warm so it is your preference. 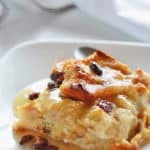 This was Amazing…i have done this recipe several times..it’s my one and only go to for bread pudding. The apple sauce paired very well with it. Thank you Alvarez, I am happy you liked it. Bread pudding is so good, isn’t it? There’s a reason it’s a classic dish, and one found in many different cuisines. This looks terrific — good for dessert OR breakfast! Thanks!